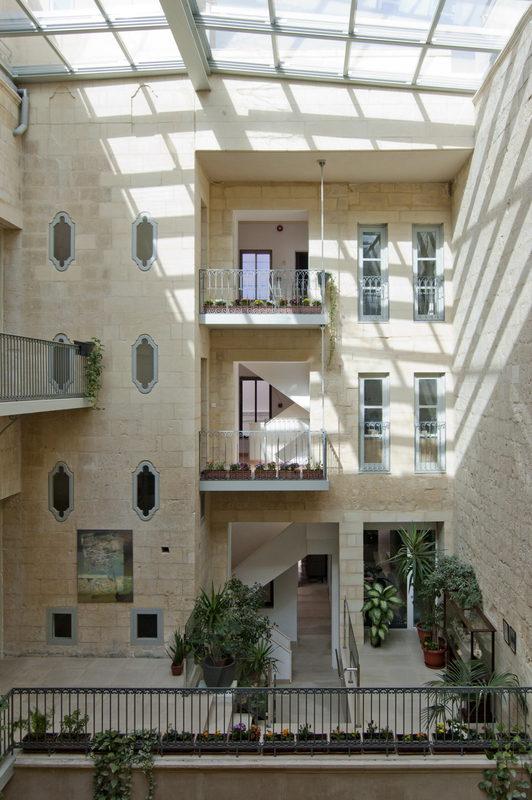 The Valletta offices of Ganado Advocates has won the 10th edition of Din L-Art Helwa Award, under the Rehabilitation and Re-Use of Buildings category. Din L-Art Helwa, a Maltese environmental NGO, organises the annual award scheme to give public recognition to projects of an architectural importance that contribute to the Maltese built heritage. The Ganado Advocates Offices comprises of two back-to-back buildings, situated in the heart of Valletta and originally date back to the first phase of the building of the Valletta, although they must have been rebuilt during the middle to late 18th century, when the city underwent a massive restructuring. Prior to the recent conversion, the two buildings were used as residence for individuals allocated by a governmental Requisition Order. The properties remained inhabited until the start of the project, but due to decades of neglect they had fallen into disrepair. The conversion, both from a conservation and from an identity point of view, aimed at retaining the Maltese character of the buildings. A primary design challenge was the mediation between the expected image of the company by the client and the needs and comfort of its employees. The large courtyard in one of the buildings was restored to become the heart of the office, around which all other activities take place. The interface with the public is accommodated in areas close to this public domain, while quiet spaces have been created in the more secluded parts of the various floors which are used for private and individual work.